In our mobile and always connected world, packing for a business trip or a vacation includes one inevitable question: what devices should I bring? While we may strive to carry our entire office or home theater with us, there’s always a chance of getting to our destination and discovering we don’t have everything we need (because of trying to travel light or simply forgetting something). Most major hotels, resorts, and cruise lines (and some airports) offer fully equipped mini-offices known as business centers that can usually provide everything from a copier or fax machine to power cords to printers and even fully equipped desktop computers. One thing that’s becoming more common is to see business centers populated with iMacs rather than Windows PCs – and for good reasons. Business centers have been on the decline as mobile technology has exploded into the business and consumer markets, but that doesn’t mean they’ve become completely obsolete. Most of don’t travel with a printer and flying with just an iPad or iPhone may lead to the occasional need of more robust computing. Also trips to remote destinations may make simply picking up a new power cord or local 3G signal impossible. That’s also true of cruise ships. 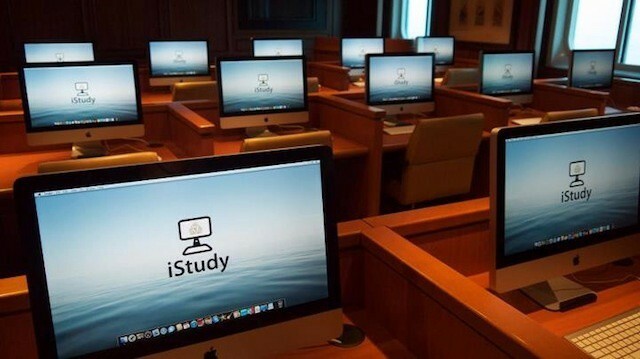 As TUAW notes, the luxury cruise liner the MS Queen Victoria now offers an “iStudy” filled with iMacs. The ship joins two of its Cunard sister ships in offering an iStudy that can be used as an Internet lounge as well as for educational programming. On the cruise line’s Facebook page, however, there are several comments that Cunard should offer desktop PCs as well as iMacs. This argument is a bit absurd. More and more hotels and resorts are joining Cunard is delivering business centers and similar facilities with iMacs. The reason being that they can be deployed with OS X and Windows 7 – allowing a simple sign or brochure to direct people how to select the operating system of their choice. As business centers continue to get squeezed more, consolidating to an all Apple setup allows that choice for guests without doubling the number of computers being purchased and supported. Since the computing needs in these facilities are fairly basic, there isn’t even the need for virtualization options like Parallels or VMWare Fusion – Apple’s Boot Camp suffices and saves a bit of money. More importantly, Boot Camp is easier for short term users to grasp: simply hold down the option key at startup and then click the icon for Windows.